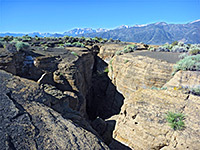 On the northwest shore of Mono Lake, Black Point is a low volcanic hill, composed of ash and brownish-yellow conglomerate; unremarkable from a distance but concealing several deep, narrow fissures, which resemble small slot canyons. The generally dull-colored rocks in the canyon walls are enlivened by patterns caused by evaporation and rainwater staining, while other parts have been subject to mineral deposition, causing strange knobbly textures to develop, so the overall effect is unusual and photogenic. 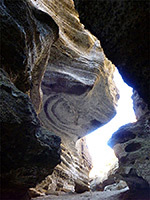 The fissures may be reached quite easily by a one mile hike from a BLM-maintained trailhead; a gentle climb across cinders and ash to the level plateau on top of the point, and although up to 80 feet deep, all the ravines have sloping ends and no major obstacles, so can be fully explored without much difficulty. Besides the fissures, the top of Black Point is also worth visiting for the grand views of Mono Lake, Mono Valley and the Sierra Nevada to the west, and the trailhead makes a good, if lonely, place for primitive camping (free of charge). Mono Lake is a quarter of a mile away and there are a few small tufa formations near the water's edge, though they are not so large and intricate as the more well known deposits along the west and south shoreline. Black Point was formed by an underwater eruption, in times when Mono Lake covered a much greater area than now, and the fissures were created by the consequent rapid cooling of the ejected material. 20 views of Black Point. Black Point is reached by the initially paved Cemetery Road, branching east off US 395, four miles north of Lee Vining. This road passes a city park with Mono Lake access, and then the cemetery, before becoming unpaved and eventually meeting CA 167 after another 4.5 miles. One road forks off quite soon, leading directly towards the point a little way east, but this serves a working mine and is closed by a gate; instead, access is via another, signposted, side road 1.7 miles further. This runs along the north side of the point then turns south, ending at a parking/camping area with information board and map. This road is rather narrow and bumpy but should still be suitable for regular vehicles when dry. Several 4WD tracks branch off along the way, leading to other parts of the point and to locations along the north shore of Mono Lake. At roads end, the lake is reachable by a 5 minute walk over a sparsely grassed black ash plain, which becomes marshy as the water approaches. Many birds rest in the shallow waters and on the semi-submerged tufa spires, feeding on the innumerable salt flies that inhabit the lakeshore. There is no trail to the Black Point Fissures, but lines of footprints show the general direction; up the east side of the gently-sloping butte, which gradually reveals successively higher layers, of soft ash, sand and occasional rocky outcrops, all partly covered by low, spiky bushes. After climbing 500 feet, the land flattens out, on top of the hill, allowing good views in all directions. The highest point (6,958 feet) is a small rocky promontory near the southeast corner, and the fissures are found 800 feet beyond, radiating northwards away from a small line of cliffs along the south edge pf the summit plateau. The longest stretches for a nearly a quarter of a mile though not all is deep and narrow. 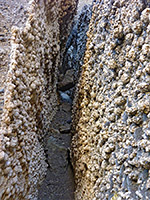 There are two main sections of enclosed fissure; one branches a few times, becoming quite deep only in the middle, and has many sections where the walls are lined by knobbly encrustations and white staining. 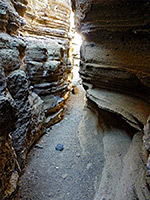 The other, extending right to the cliff edge, is generally deeper, a little less colorful, and contains a few blocking chokestones that are easy to climb over. 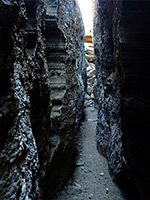 A tiny fissure nearby is too narrow to climb down more than a few feet but becomes extremely deep at one point; a dropped stones bounces for four seconds.